The Bible is one of those books (or more precisely, collections of books) that carries a distinctive characteristic which separates it from many other books, except perhaps those of a similar nature; namely, it can be considered as one of the most mis-understood of all books, and on the other hand, it can be revealed to be - literally - one of the most comprehensive and all-inclusive sources of reference and knowledge. The position taken by any person regarding the Bible can be shown to ultimately depend on their interpretation, appreciation and understanding of its contents, with particular reference (so far as this particular discussion is concerned) to certain subjects which, according to a particular interpretation and understanding, can be shown to be more closely inter-related and inter-connected than most people realized; the subjects in question being (in no specific order): Metaphysics, New Thought, Science and Religion. In the personal experience of this Author, that which may be considered the traditional or conventional interpretation of the Bible might reveal very little (if any) inter-relation or inter-connection with the subjects previously listed. Moreover, history and experience has shown clearly that, in the majority of instances, the traditional or conventional interpretation is very rarely challenged or questioned - even objectively. There are also many instances recorded to various degrees throughout history showing that, more often than not, the challenge or questioning of the established interpretation of the Bible was, at times, often met with various actions intended to discourage others from taking a similar stance - ranging from threats of expulsion and ostracization, to acts of violence against those accused or considered guilty of so-called heresy. Fortunately, in this Information Age, such reactions to intelligent inquiry regarding the meaning of the Bible have become the exception, rather then the rule. In the words of one renowned authority, who will likely be introduced in a subsequent discussion, the Bible may be considered a handbook of instruction with regard to Man appreciating and understanding the nature and being of the Original Creative Power (Spirit, Universal Mind, GOD or any other name), as well as his learning about and how to use and not to use his creative instrument of Thought. On that basis, it is a new and different interpretation of its contents (some of which was touched upon in the previous discussion on New Thought), which makes the preceding an actual working fact, which the individual can apply and use in any area which concerns themself. It would likely require an extensive discourse to lay out in full the entirety of the inter-relation and inter-connection that the Bible carries within it, in relation to the subjects referred to previously, and such a discourse has already been laid out elsewhere. All that this discussion is intended to do is to highlight just a few of what this Author considers some of the most significant points, regarding the meaning of the Bible, from the standpoint of metaphysics and similar subjects. 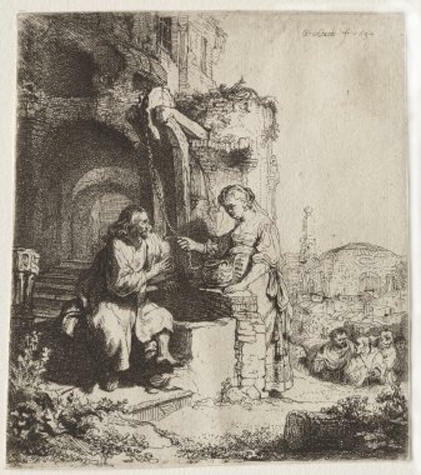 One such point is contained in the discourse between Jesus of Nazareth and a Samaritan woman (recorded in the Gospel according to St. John), where Jesus made the declaration that: "GOD is Spirit." (chapter 4, verse 24). It may be interesting to note that, according to the so-called authorized version of the Bible in circulation within the English-speaking world at one period in history, the wording of the phrase was stated as: "GOD is a spirit. ", which conveys a different meaning, than the preceding one. The wording of the first phrase ("GOD is Spirit.") can be traced out to convey the meaning the "GOD" is another name for that infinite and eternal entity which, in previous discussions, has generally been referred to as Spirit or Universal Mind. The preceding point ("GOD is Spirit" versus "GOD is a spirit") also illustrates another pertinent issue, and one which anyone seeking to understand the contents and meaning of the Bible would do well to apprehend. It is indeed debatable as to whether a clear and definite line of progression can be traced out, from the earliest written collections of sacred scriptures (likely written in the Israelite language of that day), through their subsequent translation into Greek (commonly referred to as the Septuagint), and ultimately, to their further translation into English to constitute what was at that time classified as the Authorized King James Version (c. 1611). From an objective standpoint, and notwithstanding any sacred significance attributed to both Jewish and Christian scriptures, such a time period constituting (literally) thousands of years leaves room for variations of virtually all degrees to find their way into the so-called original text; not necessarily as a deliberate intent to alter the original message, or to conceal some insight. To paraphrase the words of one who studied and presented his own interpretation of what the Bible has to teach, the way to understand the Bible is not to pick and choose select texts out of the book, interpret them literally and take a particular stance based on said literal interpretation, but to study the entire book, and thereby become aware of the truth of the entire message being conveyed. Now, if one puts that together with the previous declaration that GOD is Spirit, then it can be traced out that the likeness between GOD and Man is not "physical", i.e., reflected in Man's physical body, but rather, it is actually a spiritual likeness, expressed in the proposition that Man is actually an individualization of Spirit. If we refer to the alternate name of the Original Power as Universal Mind, then it can also be established that there also exists a mental image and likeness between Man (Individual Mind) and GOD (Universal Mind). Coupling the preceding with another point - namely the opening verse of the first chapter of the Book of Genesis ("In the beginning, GOD (Spirit) created the heavens and the earth." - chapter 1, verse 1), it is thereby revealed that the physical universe and all that it contains was created or brought into existence by some action performed by Spirit. And, as stated previously in the discussion on Mind Power, the only action of which Spirit or Universal Mind is capable is Thought, which itself leads to the conclusions that Thought possesses Creative Power, and that the same exact quality of Creative Power is present in the mind of Man, as may be said to be present in Universal Mind. The preceding amounts to an affirmation of of the inherent Creative Power of Man's Thought - a point which has been expounded and presented to those who have explored and studied any of the various schools of metaphysics which have ever existed, or which are in existence even today. "There is none beside Me ... I am GOD, and there is none else"
- Isaiah chapter 45, verses 21 and 22. This can be shown to correspond to the proposition that Spirit or Universal Mind is the one and only source, origin and root of all that exists (refer to the discussion on Universal Mind). In fact, careful consideration would reveal, from the standpoint of metaphysics, that the unity of Spirit, and the Creative Power of Man's Thought, can be shown to be two fundamental propositions that are constantly put before the reader or student of the Bible, in a variety of ways, in order to, so-to-say, drive the point home. And while there are many others, only one other point shall be highlighted here, which was first mentioned back in the discussion on Good and Evil. The visitor may opt to do the research for themself, and if they choose to do so, that is their right, but, arising out of the postulation of the Unity of Spirit (i.e., that GOD is One), it can be put forward that that which Man refers to as "Evil" cannot have its origin in Spirit or GOD, nor is it some sentient and independent entity, which acts on its own, outside of the so-called working of GOD, and that all Evil - regardless of the form it takes - is actually the outcome of Man's mis-directed exercise of his Creative Power of Thought, and it is only when the totality of the human race properly renovates their exercise of their creative faculties, that Evil will - literally - be no more. At this point, it may be asked: if such an inter-relation and inter-connection can be show to exist between the teachings of metaphysics or New Thought and the contents of the Bible, is it that a similar relation and connection may be found in the sacred writings of other religions also? To date, this Author is only aware of one person who, reportedly, has ever made such an investigation, and the only explanation he can offer for that is along the lines of what has been previously stated; namely that, arising out of the reverence that has generally been inculcated into Man - whether individually or collectively - for religious scriptures, in times past, most if not all attempts to work out an alternative interpretation of scripture as compared to that imparted by the leadership of any religious body, was either dismissed or denounced as heresy, or in some cases, blasphemy, and in the latter case, severe punishment was meted out to those considered guilty of such actions. However, and as stated before, such behaviour has become the exception, rather than the rule, so that, all that may be required for any such investigation to take place, is someone making the decision to do so. In addition, another question may also be raised: if such revelations are indeed to be found in the contents of the Bible, are they being imparted to those who call themselves Christians, and, if not, why not? Based solely on his own observation, this Author holds the viewpoint that, with very few exceptions outside what might be called the New Thought Movement, he has seen no evidence or indication that this is the case with so-called "conventional" Christianity. And as to any answer to the point: "if not, why not? ", all that this Author can offer is that the leadership of those denominations of conventional Christianity are unaware of those revelations. To borrow the words of an authority on the subject - and which can be traced back to similar statements credited to Jesus in the New Testament - the leadership has formed "... a conception in accordance with the tradition they have received from others, and until they have learned to think for themselves, they have to abide by the results of that tradition." And, in accordance with much that has been stated in previous discussions, the results of abiding by the traditional or conventional conception is, simply, the repetition of the results they have been previously obtaining. If the maintenance and perpetuation of some particular result or results is what a person wants, then it is not the business or purpose of anyone else (Author included) to change their position on the matter. What follows at this point is primarily intended for anyone who is honestly dis-satisfied with the results they have been realizing in their lives and who genuinely seek to change said results. To put it simply, since Thought has been proven to be the starting-point of all things, then it logically and sensibly follows that Thoughts and Ideas (or more precisely, Beliefs) must be changed, before any Results will change in a corresponding degree. And, while it may not necessarily be the only means of effecting such a change, an apprehension of the content and meaning of the Bible, from the standpoint of metaphysics and New Thought, is certainly one way to bring this about. Speaking form the Author's own perspective, it does not necessarily require that a person who does not profess to be a Jew or a Christian must abandon their current religious affiliation and (so-to-say) "be converted". It only requires a sincere desire to gain understanding - and a deeper and wider understanding at that. Without question, the most comprehensive reference source encountered by this Author to date, which offers such an interpretation of the Bible, as described by the contents of this page, is to be found in a certain book, which has been referred to in one or more preceding pages. As a starting point, a web link is provided below by which the visitor who wishes to undertake further investigation may commence reading of the full text online (clicking the link will open a new browser window). Based upon this Author's own experience, it is neither expected nor suggested that the visitor must go through the entire book in one session - it will likely require many re-visits and repeated exposures to its contents, but the Author volunteers that anyone and everyone who undertakes to discover the meaning of the message of this book and its contents, will realize the truth of the message for themselves, rather than merely accept it on someone else's account.